There are many ways to dry herbs so that you can enjoy them all year. 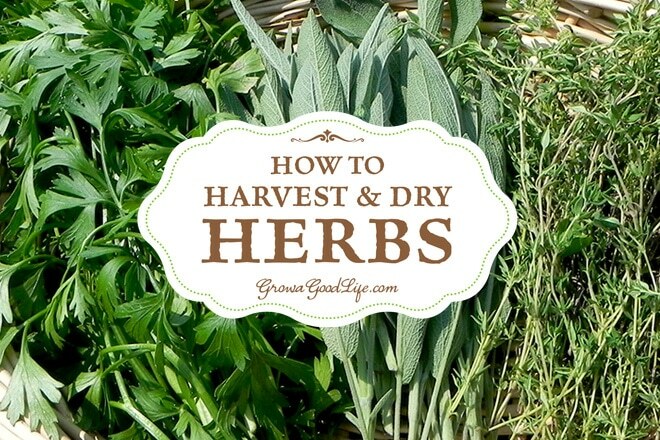 Learn when to harvest and how to dry herbs to preserve their essential oils for the greatest flavor intensity and medicinal properties. 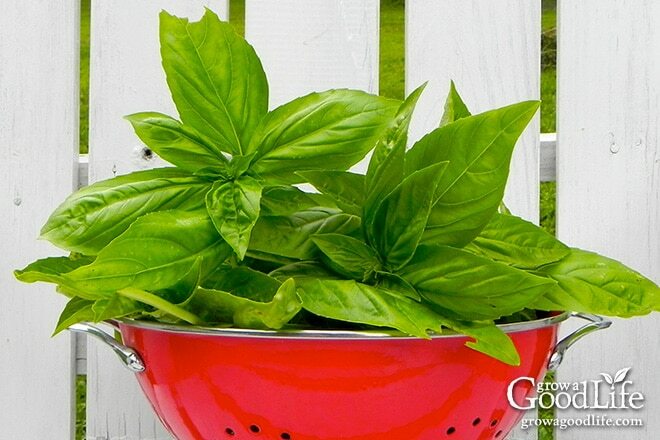 There is nothing better than the flavor and aroma of herbs harvested fresh from the garden. I really miss it when the garden season is over. While I do grow many herbs in containers over the winter to use in cooking, I also like having plenty of dried herbs on hand. Most of the flavors of fresh herbs will be lost in meals that are simmered or cooked for a long period of time. The intense and concentrated flavor of dried herbs works better for meals that are cooked slowly such as soups, stews, and roasts. Instead of purchasing dry herbs and teas, I try to grow, harvest, and preserve my own. Herbs can be harvested as needed throughout the growing season once there is enough foliage on the plant to support growth. Snipping the plants regularly help to encourage new growth and keep the herbs healthy. Limit these harvests to less than one-third of the plant so it keeps growing and producing more foliage. The ideal time to harvest most herbs for the best flavor is early in the morning right after the dew evaporates, but before the sun’s rays evaporate the aromatic oils. Foliage: Herbs grown for their foliage should be harvested before the plant blooms. The flavor of the leaves turns bitter after the plant flowers and begins to go to seed. Flowers: Herbs grown for flowers have the highest oil concentration and flavor when picked just after flower buds appear but before the blooms open fully. Seeds: Herbs grown for their seeds should be harvested after the seeds mature and dry on the plant. They will usually turn dark brown or black when ready. Choose healthy foliage, flowers, or seeds for drying. Use scissors to clip off the stems cleanly. Discard any moldy, diseased, or insect damaged parts. Leafy Annual Herbs: Harvest leafy, annual herbs like basil and marjoram by pinching off leaves from the tips of the stems right above a pair of leaves. The plant will sprout two branches above the leaves and continue to grow. This is also called “pinching off” and encourages the plant to become bushy and produce more tender foliage. Harvest leafy tips frequently and clip off flower buds to keep the plant producing. Harvest the entire plant before your first frost. Leafy Perennial Herbs: Perennial herbs such as thyme, sage, and tarragon can be harvested by the stem or sprig. Harvest the herb by cutting the stems 3-4 inches from the base of the plant. Harvest herbs with long stems like parsley and oregano by cutting the stem near the base of the plant. Harvest rosemary by cutting stems above a pair of leaves and it will branch out and continue to grow. Continue to harvest perennial herbs until about 4-weeks before your first frost. As winter approaches, allow the plant to focus on winding down for the season before going dormant. Blossoms: Some herbs have single flowers, while others present their blooms in clusters along a stem, or spikes. 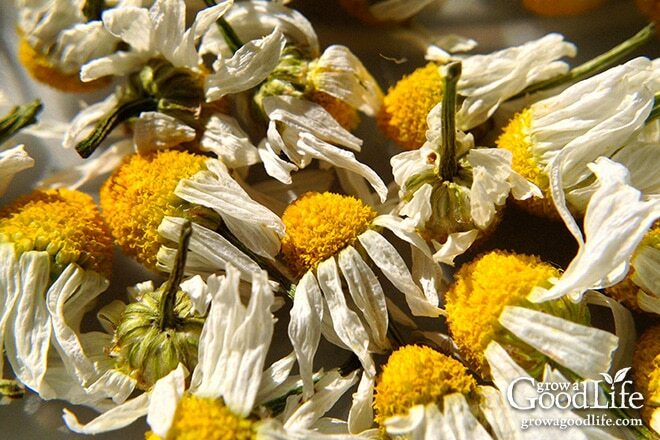 Single blossoms such as chamomile, calendula, and feverfew are harvested by picking the individual flowers when the flower is opened fully. Harvest spiky blossoms when some of the flowers are open by cutting the stem several inches from the base of the plant or above the top set of leaves. 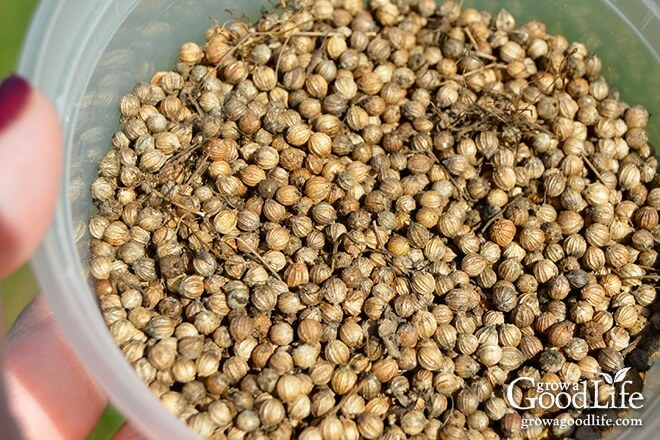 Seeds: Herbs harvested for their seeds, such as anise, caraway, coriander, and dill are dried mostly on the plant. Allow the herb to form flowers and go to seed. After flowering, seeds swell and ripen from green to brown or black as they dry. Seeds are ready to pick when they are dry. Most often, seeds will spill out when the seed head is touched. Hold a container under the seed head and clip the stem so the seed cluster falls into the container along with any seeds released. 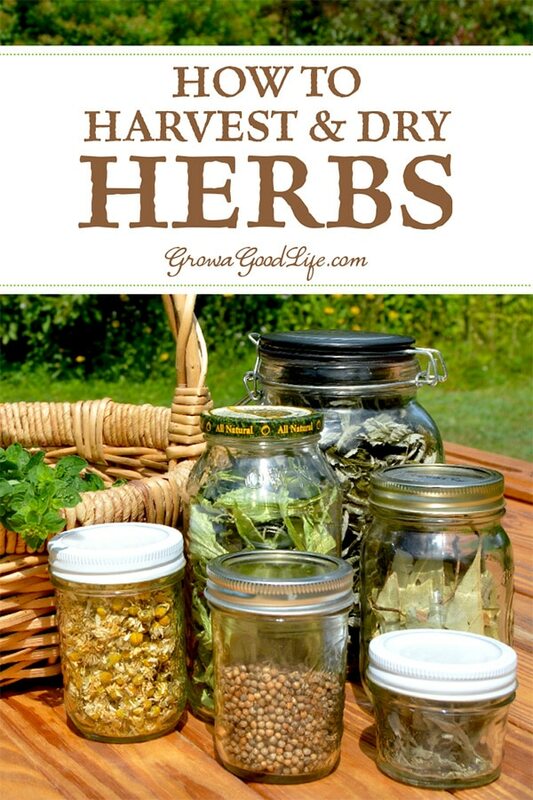 Hang and Air Dry Herbs: Air-drying is the easiest method to dry herbs with stems. Tie the stems into small bundles and hang them upside down in a dry, warm, dust-free, and airy place out of direct sunlight. I like to use elastics around the stems because they will still hold the bunch together as the stems shrink when they are dry. Air Dry Herbs Using a Drying Screen: Alternatively, you can spread the herbs out on a window screen or drying screen to dry. Suspend the drying screen over two chairs so the air can circulate above and below the screen. See how to make your own drying screen or check out these Stacking Herb Drying Racks from Gardener’s Supply. 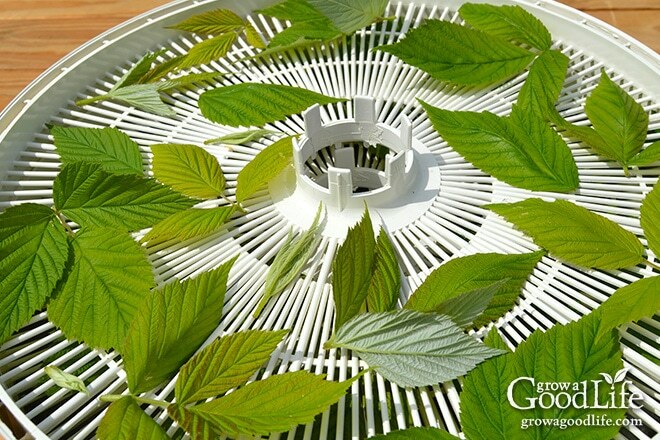 Use a Food Dehydrator: Our summers here in Maine are humid, and the moisture in the air can prevent some herbs from air-drying naturally. I use a food dehydrator to dry herbs faster. A dehydrator works by circulating a gentle flow of air through screens. Use low heat so you don’t degrade the quality of the herbs. Further Drying Seeds: Remove the seeds from the seed heads and spread out in a shallow layer in an open container to dry further for about 1-2 weeks. Separate the seeds from the seed head and chaff. I like to place the seed heads in a paper bag with a few holes poked in the top for air. After a few weeks, I give the bag a good shake to release the seeds from the seed head. Then I separate the seeds from the dried plant material and spread them out in a shallow container for additional drying before storing. Once the herbs are completely dry and brittle, remove the leaves from the stems and store loosely in clean glass jars or containers with airtight lids. To retain the herbs’ flavor and potency, don’t crush or crumble them until just before using. Label your jars the name of the herb and the date. Store your jars in a in a cool, dark place, away from heat, humidity, and temperature fluctuations. Believe it or not, the kitchen cabinet is not the ideal place to store dry herbs. I keep the bulk of my herbs stored in large jars in a in a cool, dark little-used closet. I fill up small herb jars with about a month’s worth of herbs for the kitchen cabinet. Dried herbs will remain potent for at least six to 12 months when stored properly. Keep in mind that strength in dried herbs is more concentrated than fresh herbs. If you have a recipe that calls for fresh herbs, substitute with about one-third the amount of dried herbs. Why keep them out of direct sunlight when drying I was thinking of putting a circle hanging rack to dry my herbs on in my greenhouse is this not a good idea? Nicole, Drying herbs in direct sunlight can cause the herbs to lose color and flavor. It is the same when storing jars of herbs. It is better to keep herbs out of the sun when drying and storing. I just spread my herbs out on a cookie sheet and put them on the back shelf of my car on a hot day and they’re done in a flash! Aimee, I love it! That is a great way of drying your herbs. Love the idea of using the paper bag with holes in the top! I like hanging my herbs to dry (they look so pretty), but the humidity usually kicks in by July and I switch over to the dehydrator.